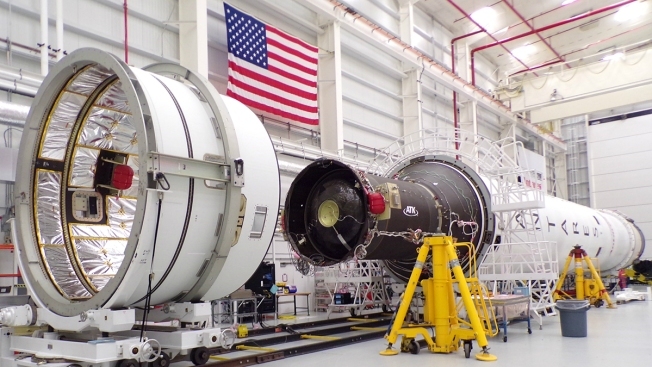 Antares rocket inside NASA's Wallops Flight Facility ahead of planned Nov. 15 launch. East Coast residents who awake early Thursday morning and look eastward may be able to see a rocket blasting into space. 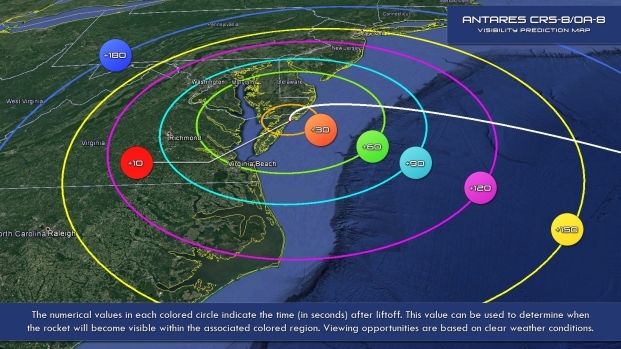 NASA has scheduled a launch of the Antares rocket for Thursday, Nov. 15. The vehicle at the Wallops Flight Facility on Wallops Island could deploy as early as 4:49 a.m.
Thirty seconds after launch, space gazers on Wallops Island and nearby Chincoteague Island will have the view. About 90 seconds after launch, those in Washington, D.C.’s Metro area may be able to see the rocket. Near Leesburg and further west, the rocket will be visible about 120 seconds after launch. NASA has scheduled a launch of the Cygnus spacecraft for Thursday, Nov. 15. The rocket could leave the Wallops Flight Facility on Wallops Island as early as 4:49 a.m. and be visible across the East Coast. Break out your smartphone and open up a GPS application to make sure you’re facing the right direction: about 115 miles southeast of D.C. Wallops Island is near Chincoteague Island in Northampton County. Visibility depends on weather and other factors, NASA says. Dedicated fans can travel to NASA Wallops Visitor Center and view the launch about 4 miles away from the actual site. The visitor’s center will open at 1 a.m. Thursday. It’s recommended that spectators arrive at least three hours before launch time. The rocket will resupply the International Space Station with tools to enable research on projects including how gravity affects concrete hardening and how to turn waste plastic into material for 3D printers, according to NASA. It will carry 7,500 pounds of groceries, hardware and research, the Associated Press reported. This mission is aerospace and defense company Northrop Grumman’s 10th commercial resupply effort, NASA says. Metro closed the station serving Reagan National Airport on Friday ahead of Veterans Day weekend, spurring a traffic and commuting mess that spilled into Arlington and other Metro stations.